So you have started thinking about your NEBOSH practical assessment, we thought we’d put a few things down here to answer some of our Frequently Asked Questions. It is important to note that the practical assessment is performed in your place of work. Before completing your observations, you should obtain permission from the relevant person(s) at your company to use their premises for the purpose your practical assessment. If you are not working, please contact the Exams Team (exams@rrc.co.uk) and we can help to arrange for a suitable assessment venue. This could be onsite here at RRC, or at our RRC Construction site which we only have here in London (subject to availability). * NOTE: If you are completing the NEBOSH Construction Course, your practical assessment MUST be on a construction site, this cannot be performed in an office environment. You do not need to have anyone with you to complete your practical; the completion of the assessment is YOUR responsibility and is completed in your own time. No representative from RRC or NEBOSH will supervise this. Your assessment can be handwritten or typed, and this includes the Observations Section and the Report Section. BUT, the observations MUST be completed on the official NEBOSH form. You will need to POST your assessment, but please ensure you have taken a scanned copy (for your records) before you send this to RRC (our address details are below). We advise all students to post their practical assessments by Recorded and Signed For Mail. You are responsible for your coursework, and tracking the documents to RRC. You are able to track your parcel via recorded mail and will know when it has been successfully delivered. Again, please take a copy of your assessment, this is a safety precaution and ensures your work is not lost. Assessments must be completed no earlier than two weeks prior to your exam. The deadline to submit the assessment will be one week after the exam. This gives you a three week window in which to complete and submit your assessment. The specific dates will be emailed to you, so please ensure you know exactly when your assessment is due to be submitted. How to fill in the Assessor’s Marking Sheet. 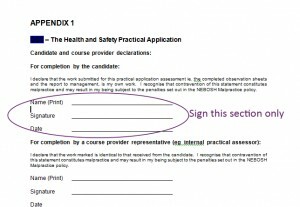 Please ONLY sign the candidate section and NOT the assessors section. Available in English, Arabic, French, Portuguese (European), Spanish (European), Russian & Turkish. Available in English, Arabic, French, Portuguese (European), Spanish (European), Russian and Turkish languages. And last but not least, we wish you all the best in your practical exams.